If a person happened to be on Yap Island, in the Caroline Islands (today a part of the Federated States of Micronesia), their gold or silver coins wouldn’t have been worth much. 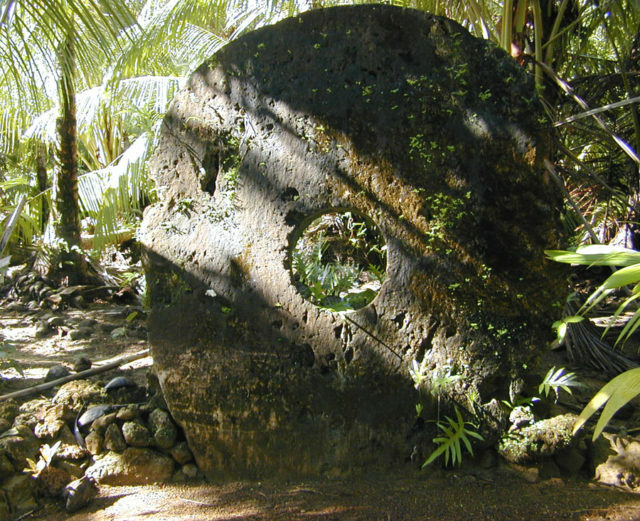 Up until the 19th century, the people of Yap had a strange method of payment. They used some big, circular stone disks, usually carved out of limestone. That’s right: big chunks of rock. These stones, known as Rai, were obtained from quarries on the island of Palau, and then transported to the isle of Yap. 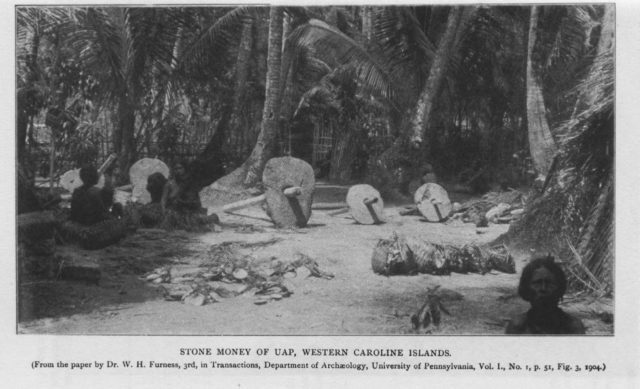 The stone tokens of Yap were just the physical manifestation of the monetary system; without the oral history of their ownership, they were just worthless pieces of rock. That is why stealing them was pointless: if the transaction wasn’t officially recorded in the oral history of the island, it still belonged to its old owner. The person that owned it needed to announce that he no longer possessed the stone and passed it on to another. Rai Stones came in different sizes. The smallest ones were just 7-8 centimeters, while the largest ones were up to 3.6 meters in diameter and 0.5 meters thick. These huge stone wheels weighed up to four metric tons. The size and the craftsmanship of a particular Rai Stone were only a small part of its real value. What made the stones precious was their history. If many people died while the stone was transported, or if a famous sailor brought it on the island, the rock was considered as rare, and therefore more valuable. The more stories surrounding the stone, the more its value rose. When the stones changed ownership, there was no need to take it and move it to another location physically. They rarely moved them due to a risk of damage, and probably because moving them would cost more than the value of one stone. The whole island was a huge bank, and everybody knew the location of their “money.” There were also those who wanted to “show off” their wealth and placed their stones in their front yards. Their financial system worked so well, that even if a Rai Stone was lost (dropped to the sea floor for example), everyone agreed that it must still exist. Even those Rai were still used in transactions. So when did this trend start, and how? Local legends say that the people of Yap discovered the limestone on Palau 500 to 600 years ago, when Anagumang, a Yapese sailor, led an expedition there. He noticed that they didn’t have such stone on their island and therefore considered it as precious. 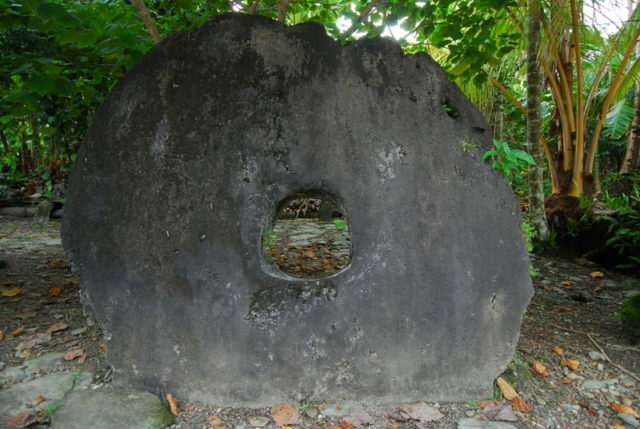 Allegedly, Anagumang ordered the first blocks to be cut in the shape of a fish, but stone wheels were chosen later because they were easier to transport. Laborers used to put a pole inside the hole in the middle to help them carry the Rai. The Yapese didn’t take the Rai Stones for free. 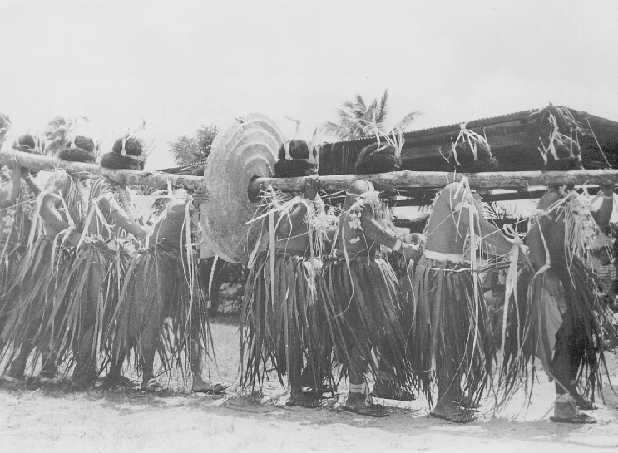 They needed to barter with the people of Palau who required large amounts of beads, coconut meat, and copra. According to archaeological evidence, limestone blocks have been mined in Palau since 500 AD, but most of the Rai mining was done between 1000–1400 AD. Presentation of Rai Stones for Federated States of Micronesia inauguration. A noticeable change was made when the Europeans started to visit Yap. With the new tools available, the stones grew in size; it is speculated that the currency transformed from small carved beads into huge stone wheels. Like in every organized economic society, the value of the money tended to change a lot. The same happened with the Rai. 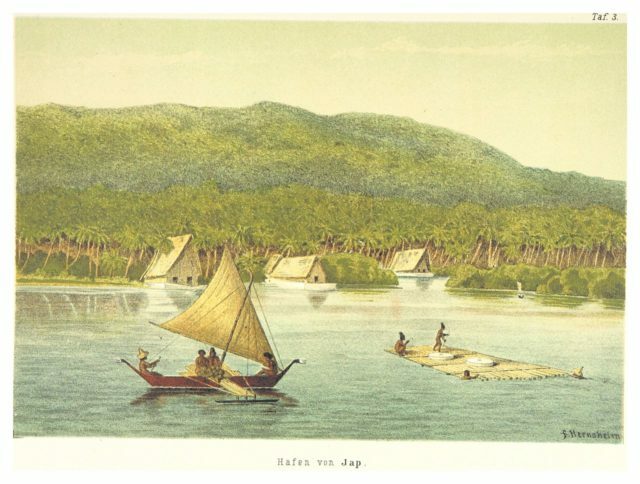 An American ship captain called David Dean O’Keefe was shipwrecked near Yap in 1871. After the natives had saved him, he helped them with the limestone extraction. O’Keefe gave them iron tools and, in return, he got copra and trepang, valuable exports in the Far East. In 1954, the story of David Dean O’Keefe was used in a Hollywood movie called His Majesty O’Keefe. A form of inflation happened on the island after these events. New Rai Stones, extracted with the help of iron tools, were less valuable than the old ones. 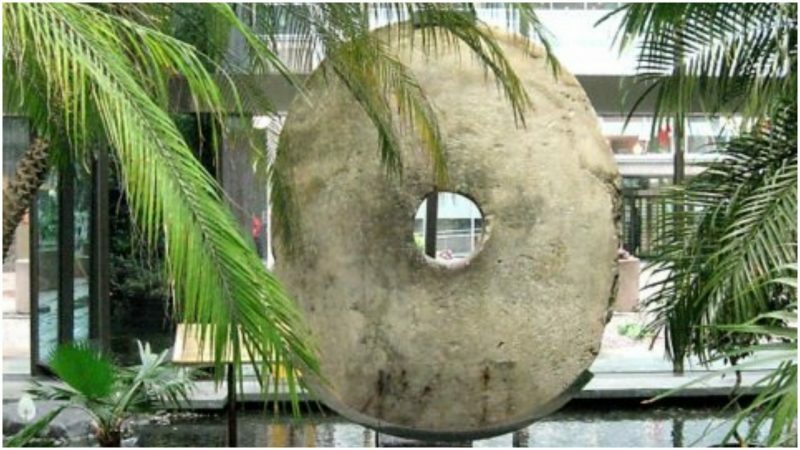 At the beginning of the 20th century, Rai Stones were almost out of use; they were slowly replaced by a more modern monetary system. Today Yap, as part of Micronesia, uses the US Dollar as an official currency. Nevertheless, Rai Stones still play a significant role in their society. They are used for many meaningful social exchanges, such as marriage, inheritance, political deals, or as a sign of an alliance. Those stones that are not placed in museums can be seen in front of meetinghouses, along pathways, or in front of some homes. Rai Stones are the national symbol of Yap and are depicted on local license plates.